ATFAQ097 – Q1- Public workstations, Q2 – best password managers , Q3 – voice input options , Q4 – portable handheld magnifiers , Q5 – App Showdown: Accessible support for Android, Windows, Apple , Q6 – Abbreviation Expansion software, Q7 *Wildcard question: What do you use for personal reminder systems? Panel – Brian Norton, Belva Smith, and Josh Anderson – Q1- Public workstations, Q2 – best password managers , Q3 – voice input options , Q4 – portable handheld magnifiers , Q5 – App Showdown: Accessible support for Android, Windows, Apple , Q6 – Abbreviation Expansion software, Q7 *Wildcard question: What do you use for personal reminder systems? BRIAN NORTON: Hello and welcome to ATFAQ episode 97. My name is Brian Norton and I’m the host of the show. We are so excited that you’ve taken some time to tune in with us this week. 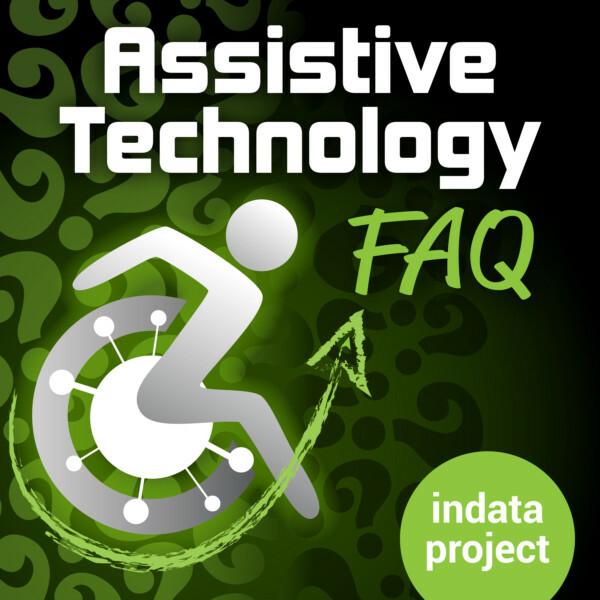 We have a great lineup of assistive technology question for you today. Before we jump in, I want to take a moment and go around the room to introduce the folks were sitting with me. First is Belva Smith, the team lead for our vision team here at Easter Seals Crossroads in our clinical AT department. You want to say hi? BRIAN NORTON: Excellent. We also have Josh, the manager of our clinical AT program. Josh? JOSH ANDERSON: Welcome back everybody. Happy April. BRIAN NORTON: You may also recognize that voice from the AT update podcast. Just manages and produces that particular podcast. If you haven’t checked that one out, go ahead and do that. We would love for you to be able to listen to that one as well. Is a news and information show where they talk to thought leaders and folks in the field of assistive technology to figure out what’s coming out next. Really great show. I want to take a moment for the folks who are new with us just to talk a little bit about how our show works. Be come across various assistive technology questions each week, and we provide folks with a variety of ways to get those question to us. The first would be a listener line, 317-721-7124. Or you can send us an email at tech@eastersealscrossroads.org. Or send us a tweet with hashtag ATFAQ. Those are the ways you can provide us with questions. Or you can also provide feedback. We are trying to tackle some questions that have come to us, and based off of our knowledge, we are trying to answer those the best we can. We know that you guys may have experience with the same type of assistive technology, may have your own experiences and want to provide feedback with is based on what you guys have experience. Take some time to let us know what you think or the answers that you have to the questions we try to cover today. BELVA SMITH: Please. Give us your answers. BRIAN NORTON: We always love hearing from other folks. JOSH ANDERSON: That would be really nice. Just have a show where we read the question and read their answers. BRIAN NORTON: There you go. If folks are looking for our show, obviously you found it to our website or other places, but we are found all over the place. You can find us on iTunes, to our website ATFAQshow.com, or stitcher, Google play store, most places where you can find or download podcast. We would love for you to be able to tell other folks about it. That’s all I have for me. Am I missing anything else? JOSH ANDERSON: Nope. Goodbye everybody, great show. BELVA SMITH: I would like to throw out there that I still can’t ask my A Lady to play ATFAQ. If you guys have figured out a way to get her to play it, let me know. BELVA SMITH: I have that. I can play all kinds of podcasts. JOSH ANDERSON: Anypod won’t let you play ATFAQ? BELVA SMITH: I play all kinds of podcasts, but for some reason it won’t pull up ATFAQ. I think it’s because it’s one thing we to say the whole name, and I don’t want to say the whole name. This is one acronym that I do like using. BRIAN NORTON: That’s so funny. If folks have gotten a chance to listen to our podcast over the Echo devices, let us know. We would love to hear from you. JOSH ANDERSON: If you would like to record your voice so Belva can play it on your phone, she could have the A-lady play it for her. BRIAN NORTON: Without further ado, we’re going to jump into some questions for today. BRIAN NORTON: Our first question was an email from David. He’s looking for ideas about what AT component should be considered for public access workstations at a library. I believe we’ve tackled these types of public access workstations before, so we will go over some of those things. For me recently, we’ve been asked many times to look at public workstations in libraries, work one offices – which in Indiana are the unemployment offices through the Department of workforce development. The landscape has changed a little bit. I believe, for a public workstation, 10 to 15 years ago, we used to recommend the same adaptive software that everybody used to get. You would pay a lot of money for the software like JAWS and ZoomText and special keyboard, those kinds of things, but I think nowadays with where Windows has gone with their adaptive and accessibility, I think there is a lot of things built in that can offer the same generic – maybe not generic, but simplified accessibility to folks. Nothing about the built-in magnifier, the built-in speech to text, speech recognition software in Windows. Those things are going to appoint where think they are a lot more user-friendly and a lot more accurate and do a lot of the things that may be some of those paid-for systems do. In a pinch, for a public workstation, they may do the trick for folks. JOSH ANDERSON: One important thing with using the built-in’s, is those are going to update as the system updates. If you do put JAWS or something like that on a system, that’s great, a few years down the road, maybe Windows does an update that isn’t compatible anymore, something you will have to pay more money in order to do. If you got someone coming in twice to three times a day, it’s probably worth it. In our experience with a lot of the accessible workstations, they don’t get used every single day. They are there for folks when they need them, and everything, but they don’t really cover the cost of being updated all the time. You do want it to be able to work when you do need it. BELVA SMITH: Right. I will say that one of the experiences that we found when we were putting together these workstations is you have to have — you have to be experienced or have someone who is experienced use most of these third party programs, we will call them. But if you do the included accessible features for either Windows or Mac, they just seem to be a little more intuitive, and they are easier for a person who may not have a lot of skill and using them. They are easy to figure out how to use. One of the things I would say to David is to keep it simple. That’s always my theory. And think about your user. You will want to make sure that you’ve got your low vision and blind consumers – of course, this is coming from the vision team lead. You are going to want to make sure you have those folks accommodated, because they are more likely to get public transportation into the library to use a public computer system. But and also you want to make sure that you have also accommodated the individual who has difficulty typing, so you do want to be able to have the speech recognition, which means to want to have a headset with a microphone. This is true whether you are doing Windows or Mac. Either way you’re going to want to make sure that your workstation includes a headset and that your seating and positioning is accommodating for those individuals as well. For example, you may have a blind user who is going to come in with a guide dog, so you want to make sure that there’s going to be room for the dog to fit without being out in the walkway or on top of someone else. Also, you may have an individual that comes in in a wheelchair. One thing we used to do without workstations is recommend the height adjustable desk so that a wheelchair user can roll up under it. I don’t know that a height adjustable desk is a necessity, but you do want to have a probably higher than normal desk to make sure that the wheelchair user can get in. Really, I think the only additional equipment besides your computer is maybe a large print keyboard and perhaps a higher desk, a headset, and just use whatever accessibility features are included. Because you’ve got – I’m going to change that. I am going to say that perhaps you do want to put NVDA, Non-Visual Desktop Application. BRIAN NORTON: Because it’s still free. BELVA SMITH: It’s free. And the screen reading feature in Windows, though it’s gotten way better, it still got a long way to go. I would definitely include that as one of the additional softwares. JOSH ANDERSON: I agree with you, though. The only thing I would add is maybe a little bit larger screen monitor. If you’re using magnification or something – depending on if you’re using a 19 or 20 inch monitor, you are not going to get much information. Something we always ran into was people would get scared by NVDA or what if someone comes in and they want to use a computer, do I have to train them how to use it? Usually I tell him if the person is coming into use a computer, they probably use something like this before. If not, that’s when they need to talk to their local tech act project or something like that, or maybe try to find some training or what they need. The nice thing about NVDA is if the person uses Josh at home or has used JAWS before, a lot of the keystrokes are going to be similar and they will still probably be able to use it. I think you brought it up, what it is they need to access. Are they going to be online? If it’s a library, is there a website they need access to in order to find books or information? BELVA SMITH: That wasn’t what you think. I moved the microphone. BRIAN NORTON: I was going to say, stop moving microphone. BELVA SMITH: I decided my back was facing Josh, so I needed to turn around a little bit. JOSH ANDERSON: I didn’t notice. That’s the bad part. BRIAN NORTON: If you didn’t hear it, it was just a screech. JOSH ANDERSON: Anyway. Kind of getting back, what it is they have to access? What’s going to get the most people the access to the information? BELVA SMITH: Depending on how much money you have to put into this project, having some sort of a CCTV might also be a good thing to have. Again, coming from the vision team lead here, I’m thinking of the individual who might have difficulty. Maybe they are coming to fill out an online application, they also have some printed paper they need access to. Having some sort of CCTV or magnifier at your station might be a good idea. That takes your cost pop. BRIAN NORTON: I always thought in these situations can take about 20 percent of the technology out there to meet about 80 percent of the needs. There are just going to be individuals who cannot accommodate. Their needs are going be too great or different. Whatever tools you have to you can’t address every need, so try to meet the majority, 80 percent of those needs with using that 20 percent of technology. Today, the built-in stuff is fairly good and there are free options for the things they need a little bit more stronger presence like NVDA. Narrator is a good product, it doesn’t quite get you the screen reading that you think you might want or need if you are trying to surf the web and do all these different things, depending on what you really using it for. That’s when NVDA can step in. That’s a shareware, freeware program, so a pretty good option. So I would love to hear from folks. If you guys have any feedback for David about a public access workstation, we would love to hear from you. You can do that in a variety of ways, by giving us a call on our listener line at 317-721-7124, or sending us an email at tech@eastersealscrossroads.org, or send us a tweet with hashtag ATFAQ. We would love to hear from you. Great answers, folks. BELVA SMITH: I personally use last pass, and I use the free version because I find it gives me everything I need. However, if you want more from the program, you can pay $36 a year, which is very reasonable. JOSH ANDERSON: That’s not bad. BELVA SMITH: For that $36, you get a larger list of additional features. I personally was just looking for something that could make my secure passwords for me and then keep track of them. Again, the danger in allowing the program to make my passwords for me as I never know my passwords. BRIAN NORTON: You know one master password, that’s it. BELVA SMITH: Yeah, that’s it. A knows all the rest of my passwords. However, I was notorious for using the same “monkey123” password for everything, which is the most insecure thing you can do. The idea that it’s creating secure passwords for me does maybe feel better. But with the paid version, you also get the option where if you pass away – which we really don’t want to think about – but think about all the information you do keep stored on your computer like your bank passwords and all those kinds of things. If you are the only one that knows those and something happens to you, that’s going to be a real nightmare for the folks remaining. It does give you the option of setting up an emergency list, so to speak. So then if I passed away, I would have a list of two or three people that could send an email and say they are trying to access. If I didn’t respond within three days, then they would get my information. Because of that, people keep all kinds of information. It does allow you to store things like your passport and that stuff as well. Last pass is what I use on my Mac. I really like it. It’s really made life easier. BRIAN NORTON: You just use the browser extension? BELVA SMITH: I used the three last pass version. For my phone, I’m just using the Apple save your password. JOSH ANDERSON: The keychain password thing? BELVA SMITH: Right. I did find a website, imore.com/best-password-manager-apps-mac. They have a whole list of different password managers. The good news is – I think Josh and I say this all the time – you can try most of them for free and then figure out which ones going to be the best one for you or which one is the most affordable for you. Like I said, the free version has been working fine for me, and I’m happy with it. BRIAN NORTON: I use last pass as well. The only issue I have with last pass and even maybe some of the Apple stuff that gets caught up in the keychain, and I even have Google asking me if it wants to save the password for different websites. The only issue I have with those things that you need to remember to log out. When you are done with your browser, log out. Because anybody could come pick up on my computer Open it up, get in my browser. If it’s logged in, they have access to all my stuff. BELVA SMITH: I tell my clients all the time. If you are on a website or in a program that has a sign or log out, it’s therefore a reason. Use it. BELVA SMITH: It’s like putting the car in park when you’re still trying to drive, if you are just closing the window and not signing out. JOSH ANDERSON: Brian and I use the same computer for podcasting. Most of the time when I come in, I’m in his dropbox account, and is of little account. A lot of times when I open chrome, it opens every window he had opened. Sometimes it’ll even say do you want to put in your last pass password. It’s important to do that because I could probably access most of Brian’s stuff. BRIAN NORTON: Exactly. That’s challenging. I ended up with last pass for no specific reason. I had a coworker who was using it. He told me about it, I started trying it, fell in love with it. Like Belva mentioned, that imore.com/best-password-manager-apps-mac website has some other options like 1Password, mSecure, EnPass, one called Keeper, another called Data Vault. There is a whole lot. I’ve even seen something, almost like a bracelet that folks wear, and actually keeps her passwords as well. Maybe it unlocks with proximity. BELVA SMITH: There is an android device that you can use to store your passwords on as well. BRIAN NORTON: I even have my watch – or I did have my Apple watch connected to my Mac, and it would actually unlike my Mac just simply by my watch being near the Mac. That was pretty cool, although I think that’s probably the easiest password to remember, is want to get into the computer, because I used I went all the time. JOSH ANDERSON: Sure. Just remember it the worst one is the Post-it note stuck to the monitor. BRIAN NORTON: So you can make notes to yourself. JOSH ANDERSON: That’s not bad. How much did you say it was? BELVA SMITH: $36 a year. JOSH ANDERSON: Not bad at all. BRIAN NORTON: I think for most folks, the free version is going to do just fine. Awesome. If you guys use a password manager, let us know what you guys use, what your experience has been with that. You can reach out to us through our listener line, which is 317-721-7124. Or give us a tweet with the hashtag ATFAQ. We would love to hear from you in that way. Let us know. BRIAN NORTON: This next question came from Lindsay. She says, “I have a general question that I was hoping you could help me with. I have an employee in a professional environment that needs a talk to text software option –” think of things like Dragon NaturallySpeaking or those types of programs “– for their laptop PC. Their primary goal is to use email, Word, integrate presentations. Do you have a recognition on one or a version that is compatible with Explorer 10 or 11.” That seems a little outdated, right? I’m not sure what version of Internet Explorer folks are on. BRIAN NORTON: Okay, so that’s newer. “Any advice you can provide as much appreciated.” The reason I ask about the Explorer’s I think a lot of times we are stuck with these old, antiquated programs that don’t work with the new version of Internet Explorer. You have to use a specific version of Internet Explorer. It’s been a while since I’ve used Explorer, but I know a lot of agencies use programs or sites that specifically need to be used on Internet Explorer instead of being a producer in chrome or Firefox, those particular browsers. JOSH ANDERSON: I would think it would depend on exactly what they’re using it worth. Word is built in with dictation if you are on a new enough version. It’s actually a dictate add-on that you can use, or if you’re using office 365, thing it automatically shows up. And it works pretty well, especially in Word. There is always the built-in speech recognition in Windows, that depend on what version you are using. If you are still using Windows 7, it’s not going to be as good as the one in Windows 10. There’s aftermarket ones too. Something that’s really important to know with any talk to text software is you need a really good microphone. The one built into the microphone is functional, it can work, but it’s not going to do as well. You are going to find yourself yelling at it with your face right up to the screen. Either a headset with a good microphone, even they make good Bluetooth microphones that go right in that year and not be in the way, or a table top one. You can get them for a pretty decent price, but the recognition is going to be a lot better when you are losing those. BRIAN NORTON: I find it depends on individual. Do they have a physical need? Are they just using it for speech recognition to be able to talk to the computer? Or do they needed to navigate the computer as well? I think there’s a whole lot to what the individual, what are their abilities, and what are they trying to do on the computer with that. I think you talked towards that. The way I always went about it with folks as I start with the free stuff, let them try and use the built-in speech recognition, and then moved to something that’s more sophisticated like Dragon. Let them try Dragon. Dragon is a great program, kind of the cutting edge of voice recognition technology. It’s a little expensive. Dragon individual professional is $300, I believe. Again, it pushes the envelope. It’s very intuitive, very easy to use, allows you to do a lot of things with navigation that are necessarily as easy to use with some of the built-in stuff. If you are just using it for dictation to fill in forms and do certain things, maybe you’re able to use your mouse and keyboard as well alongside it, maybe just trying some of the built-in stuff would be where to start. If you are needing more sophisticated, more control of the computer with your voice recognition, then try Dragon or some other product. BELVA SMITH: I’m just going to say, job site evaluation. I like how Lindsay starts this question with she has – I don’t know, Lindsay could be a boy. I did know a Lindsay that was a boy, so I’m sorry if I messed up on that. But I like how the question started with, I have a general question. To me, that’s not general. To me, that’s very deep, because we need to know so much more information to be able to make a good recrimination. I know that they give us the information that it’s a laptop, but the version of Windows makes a lot of difference. As just mentioned, if you are still using Windows 7, then you’re going to find that the speech recognition is not going to be as good. But if you are using Windows 10, I think you’re going to find that the built-in speech recognition is going to be quite good. Depending upon the laptop – like I’ve had a great expense when I use speech recognition on my HP laptop with the built-in microphone. I’ve never used a headset with that. Now I’m not sitting there eight hours a day using the dictation, either. But I could certainly open it up and dictate an email and send the email using the included microphone. I don’t know. If a job site evaluation is an option for this individual, I would highly recommend it. BRIAN NORTON: Those are always really good. Bring someone in who has expense with a variety of different programs and has used those in different situations. Because they can really provide some good insight into how to use those to be able to do what the person needs to do. As far as paid-for speech condition, it’s so built-in nowadays to most programs, beyond Dragon, I don’t know there are a whole lot. There are some add-ins to Dragon. There is in tag [phonetic] which is an ad into Dragon professional, I believe, that gives you some more accessibility beyond just the typical voice support that you get with Dragon. You can say, “Click picture,” and highlights all the pictures, those kinds of things. It lets you more easily navigate the screen just by picking and choosing what you want to click on. Other was a condition software, is there much out there? JOSH ANDERSON: So that wouldn’t help them at all. But for those folks that are using Mac, the built-in is pretty good. You do have a download it if you don’t want to just use online, but if you are online all the time, you can essentially turn it on and one with that. BELVA SMITH: Again, that’s for the Mac, not for Windows. JOSH ANDERSON: Maybe they want to change computers. BELVA SMITH: The last thing I would say is it sounds like, because we are just saying email, word, and presentations, I’m assuming they are talking about PowerPoint. So we are talking about all Microsoft applications. Again, if you are not using Windows 7, the speech recognition and Windows 10 is going to work beautifully with the Microsoft programs. If you are trying to get outside of Microsoft environment, and that’s when you might want to introduce Dragon to the game. But if you can get by with not using Dragon, I would highly recommend it. BRIAN NORTON: Don’t tell people that. We are on an question and answer show. I think in Office 365, in Microsoft Word, you will get a microphone, if you are using the online version of word, you get a microphone off to the right hand side that you can just start dictating directly from within the program. Is that available on Excel or PowerPoint? JOSH ANDERSON: That’s not in the other ones yet, that I know of, because that was the first adding that’s now available completely in it. I don’t think that’s available in the other Microsoft programs at this time. But that doesn’t mean it won’t be in the near future. With that, it does depend – I think you have to have 2016 or newer. Although if you have 2013, you may be able to go look for Microsoft Word dictation online and find an actual download to plug it in. BELVA SMITH: Right. But again, I would just use the speech recognition. I believe you are right, Josh, anything prior to 2016 you are not going to find that automatic microphone available. BRIAN NORTON: Interesting. That’s just a little information on what we know about speech recognition software and some things like that. I would love to know if anybody has anything else to chime in on that particular question. If you do, you can reach out to us at our listener line at 317-721-7124, or send an email at tech@eastersealscrossroads.org. BELVA SMITH: Yeah. I’m going to go back to what I said with the earlier question. I think this definitely is screaming that a job site evaluation would be helpful. But you may have exactly what you need in your pocket. If you are carrying any type of a smart phone, whether it’s an android or an iPhone, you already have the ability with a third party app to get access to your paperwork. That amazing app made by Microsoft, Seeing AI, would give you access to any paperwork and also can be used to look at some of your medical instruments. Whether it’s going to be appropriate for looking at all them, I don’t know. But even without the third party app, you still have a magnifier within your smart phone that, depending on how much magnification you need, how much screen size you need, you probably would find everything within the smart phone magnifier that you’re going to find within most of the four inch handheld magnifiers. And then the question is, do you need a magnifier that has a handle, one that doesn’t have a handle, one that has a stand, one that doesn’t necessarily have a stand, one that’s also going to give you the ability to have the stuff to read to you or just magnify it for you, and then how many different contrast options are important to you. Usually most people only need one other option, which is usually a reverse. Again, without trying it, you don’t know. Back in the day, there were like two or three electronic handheld magnifiers. I promise, it feels like every 30 days or 60 days, we’ve got a vendor contacting us saying, “Hey, I’ve got some new products we want to bring over.” There is always a handheld magnifier included in the new products. They are coming out regularly. BRIAN NORTON: It’s a little overwhelming. BELVA SMITH: Absolutely, it is. BRIAN NORTON: There are so many different options and features. BELVA SMITH: And the prices start at $295 and go all the way up to $2,500. And do you necessarily want to buy the cheapest one, or do you necessarily need the most expensive one create that’s all to be determined. I would say, definitely, if you can afford to make it happen, a job site evaluation. If you can’t, they definitely want to seek out your local AT act. For us in Indiana, that would be INDATA Project. We have a whole slew of magnifiers to be tried. The good thing is with us, you can check that out and take it and actually try it in your environment. Because it’s one thing to see it in the show room, but when you actually put it in your environment and tried to use it to do the things you want to do, that’s when you figure out if it’s going to be the appropriate device or not. JOSH ANDERSON: All of them have completely different bells and whistles. Some have different handles, some have tactile buttons and touchscreens, some do OCR, will talk back to you, some just do the magnification. It is important, especially if the phone or the tablet won’t meet your needs, try a couple of different ones out, because you might find out that you really need that handle in order do not drop it and be more productive and move around your environment. Or maybe you need a bigger screen, or something smaller with more contrast. BRIAN NORTON: Right. If you go to EasterSealsTech.com/states, you can look up your local AT act, whatever state and territory you are in. There are 56 of these projects throughout all states and territories. You can find that information. I would also like to add, if you are getting a job accommodation, make sure whoever you are having come to do the evaluation, make sure that they bring equipment with them. I would highly argue that an evaluation that doesn’t include equipment – you may get something that works just fine, but if you have the chance to touch it, feel it, experience it, use it in the environment. if you’re wanting something for work, meet at work if you can. I know that’s not always possible. Make sure that they bring equipment, make sure they meet with you where you are going to use the equipment so they can understand what’s happening in that environment. I always use the caveat, if a cat is going to jump on the keyboard, I want to know that it Is going to jump on the keyboard so I can address that in the evaluation. It’s important to have those things in mind as you do a good job accommodation to make sure that all of these different scenarios and situations can be looked at and addressed if they need to be so that, when you get the equipment that’s recommended for you, it is the right piece of equipment, that not only is it functional for the job you’re doing, but also that it meets the needs. It’s going to be functional, but it’s something that you like as well. I don’t know about you, but I’ve bought lots of things I thought was going to be the greatest thing since sliced the bread and realize, man, I really don’t like how this feels or the way it fits what does this or that. And then it’s like, well, I’m not going to use it. BELVA SMITH: Right. Again with that job accommodation, you want to make sure that the person that’s providing that is a person that’s doing a true evaluation for you and not just someone who is selling equipment. Obviously, if I sell XYZ magnifier and you asked me to come out and do an evaluation for you, I’m going to convince you that the one I’m selling is the one you need. I will give you a quick rundown here. My boyfriend, as most of my regular listeners no, he has RP. We have been trying to make a decision for a new CCTV for him. It that we had it picked out, but after borrowing what we thought was going to be appropriate for him, in two week’s time, he was able to say you know what, I’m not going to make this $2800 mistake. This doesn’t work for me. Because once he got it home and got it into his work environments, he realized it didn’t meet all of his needs. That’s why it’s so important to get these devices into the environment that you will use them in and actually in your hands before you make your decision. BRIAN NORTON: Absolutely. For anybody who has experience with the scent of magnifiers, maybe in a similar situation to this particular therapist, we would love to hear from you to hear what you guys using your environment. You can give us a call on our listener line at 317-721-7124. Or send us a tweet with the hashtag ATFAQ. We would love to hear from you. Thanks so much and we will jump onto the next question. BRIAN NORTON: All right, so our next question is the app showdown. This is where we take a look at a couple of different apps and we compare them. But we are going to take a different angle at this. We are going to talk about accessible support for android, Windows, and Apple. So I thought I would just throw that out there. We all use support at different times, and sometimes the accessibility and how you get a hold of folks and be able to make that happen with your adaptive technology can sometimes be challenging, or how prepared they are to answer your accessibility questions can be challenging at times. At that we will talk about that today. BELVA SMITH: That can be our April fools joke for the day. Instead of doing apps, we are going to be doing tech support. Come on, guys. That was supposed to be funny. BELVA SMITH: There we go. JOSH ANDERSON: We’ll just cover it up with that really nice hold music usually get when you are on hold for support. BELVA SMITH: So I know we’ve talked about the Windows accessibility support before, and I have had personal experience with that. So if you are a user of any type of accessibility software, and you are using Windows and have a question, then you can contact the Windows accessibility support team by calling them. This is only in the United States, so for our listeners outside of the United States, not sure what you do. Try to call the United States one and asked them, I guess. It’s a simple number, 1-800-936-5900. My experience with them has always been a good one. If you have access to the Internet — which that seems to be the case. A lot of times when you need tech support, one of the problems that you have is that you can’t access the Internet. But in this situation, if you do have access to the Internet, they do have a disability answer desk as well. There you can get all kinds of resource information. Again, that’s for Microsoft. Apple also has their hearing and vision tech support, which can be reached at 1-877-204-3930. That will give you direct access. They also have AppleVis.com, which is a great place to go and gather information about different apps and stuff that are available and whether or not they are accessible. It’s usually information that’s been provided by the users. And then if you are in Android user, and you have been to have the Be My Eyes app, they also are offering direct connect to android – or I should say support.google.com – through the Be My Eyes app. JOSH ANDERSON: Really? That’s cool. BELVA SMITH: I know. If you are a Be My Eyes user and you haven’t updated, then you should update. You will find that you can get direct connect to the Be My Eyes tech support, Google, as well as Microsoft, all with one touch of the button. BRIAN NORTON: That is really cool. BELVA SMITH: Quick and easy access to Apple, Android, and Microsoft tech support for persons that are using [Android]. Now I will say that the difference is, I think with the Microsoft, is it any kind of software that you’re using. But I think with Google and Apple, it’s more about the visual stuff. BRIAN NORTON: Right. It’s interesting, we have a relationship with our local Apple Store. Recently, probably a year or year and half ago, they actually are starting to put accessibility experts into their stores. So if you go there with a question, like the Genius Bar or whatever, they can pull over someone that has experience. I think that used to be an issue, right? JOSH ANDERSON: For sure. I can remember going in and, hey, this person’s iPad isn’t working right. They’re like, yeah, why is it talking? They didn’t even know what voiceover was, much less how to turn it off. BELVA SMITH: Right. I’ve got clients that will call and make their appointments, and they will request, I may voiceover user, so I’m going to need a geek that knows about voiceover. BRIAN NORTON: What an improvement from where it’s been, to be able to see even these phone numbers you can give a call to, to be able to talk to someone who will not just scratch their head when you ask your question. BELVA SMITH: And they are not going to just say, restart the computer. JOSH ANDERSON: Have you unplugged it and plugged it back in? BELVA SMITH: You have to reload Windows. BRIAN NORTON: Check your cables. BELVA SMITH: My experience, when – and I haven’t had the opportunity to have to use either the android or the Apple. But with Microsoft, experience was when I called, the first question they wanted to know is was I the person with the disability or whether the person working with the person with a disability. BRIAN NORTON: That’s a smart question for them to ask up front. BELVA SMITH: Absolutely. And of course what type of adaptive software where we using. JOSH ANDERSON: Just to have that straight line where you are not – especially if you’re just the person with a disability. It could be anxiety, all these other things. To call and then be put in a queue and then you get the wrong person and have to ask again, and they send you around two or three times. BELVA SMITH: And they ask you a question that you have no idea how to answer. JOSH ANDERSON: It’s still pretty new, isn’t it? BELVA SMITH: There was a day and time that, if you called, if you are a JAWS user and you called Microsoft and said, hey, I’m having this problem, they would immediately say it’s a JAWS problem. And of course, when you called JAWS, they are going to say it’s a Windows problem. I think that is sort of gone to the wayside now. BELVA SMITH: And it may be that it’s not their problem. BRIAN NORTON: I think they’ve had to, just with the nature and make about society. Folks are getting older, there is a related division, baby boomers are getting older. They’ve had to address this issue and come out with some tools for folks to be able to get the support they need. BELVA SMITH: We have so many people using computers in different ways now. Let’s face it, if they weren’t going to jump up and face this, and they were really going to be hurting. JOSH ANDERSON: Used to be that was Apple’s thing. They were the ones that thought of this, so that they could be accessible to everyone else. And then Google and Microsoft jumped on and are doing a good job of making it that way. BRIAN NORTON: I was even thinking that, even back in the day with software, it used to be – things like JAWS and ZoomText and other kinds of things, back when I started 20 years ago, Microsoft would just leave those companies alone. They were like, they’re doing a great job with accessibility, getting access to Windows or our programs. It was like, although there were some basic features, they never spent much time updating those features like the Windows magnifier and other kinds of things that have been there for a long time. It was just those folks making the adaptive software, they are doing a great job. Nowadays, their stuff has come a long way, and there seems to be bigger focused on accessibility, not just with tech support but with their putting in the systems to be able to help folks not have to pay for it. It’s built-in, a part of the program, part of the operating system, and it works. BELVA SMITH: I think so many people have come to rely – I want say come to rely, but I think so many people depend on their computer to do so many different things within a day, whether it’s work or its entertainment or communication or whatever. JOSH ANDERSON: Think of all the independence it opens up. You can open your dinner, your groceries, even have your clothes delivered, try them on, and send back what you don’t like, all straight from the computer. I can, Brian. You can’t. BRIAN NORTON: Josh was telling a couple of days ago about an app called Tide Cleaners. It’s a service where they will come to your door, pick up your laundry, take it away, longer it and folded for you, and bring it back. BELVA SMITH: What a great idea. JOSH ANDERSON: They don’t put it away. I still think they should call it a virtual mom. BELVA SMITH: Josh, when my babies were babies, we had a thing called tiny tot diaper service. I don’t think that’s available at all anymore. BELVA SMITH: That was amazing. BRIAN NORTON: What did it do? JOSH ANDERSON: And you could use the reusable diapers? BELVA SMITH: Yes. Don’t know how much it was, I got it as a gift. Tiny tot diaper service was amazing. JOSH ANDERSON: That is amazing. BRIAN NORTON: We used a diaper genie, and the diaper genie does not do magical things with the diapers. It still smells. BELVA SMITH: The diaper genie is disposables. Disposables are way different than cloth. JOSH ANDERSON: We use disposables and have a diaper genie that rests approximately three feet from where I sleep. So far it does a pretty good job. We are sleeping to baby food, so we will see. We get way off subject there. JOSH ANDERSON: I think we need to rename this, because we call it showdown, but we never pick a winner. BELVA SMITH: No. In this case, there isn’t a winner. BRIAN NORTON: It’s a split decision. JOSH ANDERSON: There is not. At least the ones I’ve used, they are helpful, and I think just having that direct line of communication is so helpful, to not have to call, well, I have this issue, and they send you to the wrong department. BELVA SMITH: Get transferred to that department. BRIAN NORTON: It’s always a split decision. Every service, every app, they have their benefits, pros and cons. Always a split decision. Maybe I shouldn’t tell people that, because you are right, it’s not a showdown. It’s the app split decision. JOSH ANDERSON: The handholding hug fest. BRIAN NORTON: Awesome. If you guys have anything to contribute to that particular question, maybe you have experience with some of the support that you get through android, Windows, or Apple, we would love to hear from you. You can send us an email at tech@eastersealscrossroads.org, or give us a call on our listener line at 317-721-7124. BRIAN NORTON: Our next question is, “I am looking for a solution to provide abbreviation expansion on a Windows 7 PC. The user wants to insert preprogrammed text with keyboard keystrokes that will go into a word document or email without having to pay from one of the documents.” This is something I have a lot of experience with. I actually use a program on my Mac called text expander. Text expander works on the Mac, but there are some Windows equivalents for it. One would be word expander. Word expander is a free version. And essentially what it allows you to do is to be able to – what these programs allow you to do is to be able to create abbreviations. I get a lot of referrals into our program, and I have to reply to all those email as I get. If I had to sit there and reply to each one individually, it would take me long time. What I look for one I would have to rewrite backup for another one. Of course, there are nuances between this person and that person because I want to make a personalized. What I end up doing is in these programs, I can set up an abbreviation, like “REF1” would be “referral response 1.” It would actually then expand out into the whole email. “REF1” four keystrokes would then expand out into 200 words if I want based on whatever FLN as the expansion piece of that abbreviation. It makes typing a lot faster, especially if you’re doing a lot of redundant typing, if you are sending out the same email over and over again, or the same type of text you put into documents or reports, if you are a programmer and type in the same line of code all the time. It might be helpful to be able to put this kind of abbreviation expansion software on your computer. Word expander is free. There is another one, phrase expander, does a little bit extra. It’s got more features, has to do with macros and automation built into it. There is a $60 standard version of it, and there is a $150 professional version of it. For the $150, you’re getting more of the sophisticated features of being able to do macros. Instead of just putting text out on your screen, you might have some fill ins, blanks that you can automatically fill in and hit the enter key and it will put that text individually into each of those particular responses. Phrase expander is one. ShortKeys, that’s made by Insight Software Solutions, they have a free version and a $30 version. Again, the paid for version is going to have extra features. One thing we use a lot here with some individuals, depending on what their needs are and what they’re trying to do, we use the AutoCorrect in Word and Outlook. AutoCorrect is kind of the poor man’s abbreviation expansion, if you will. BELVA SMITH: Don’t call it the poor man. I’m going to say that this was something that Microsoft included in Word – it’s been in there for years and years as a special feature. I think these other programs have been made based upon the word correction. It’s been around longer than they have. Yeah, Brian, you are right. For years, many years, I’ve used this for an individual, especially with a signature. We have a huge long signature and they could just type I or two keys and hit the space bar, and it gets replaced with that information, just like you were describing with that text expander. Yeah, I’m not going to call it the poor man. BRIAN NORTON: I only use that term simply because it’s not what it was intended for. It’s intended for when you type that word over and over again, where your muscle memory goes awry on you when you are typing, and you know you misspelled it but you look back on the screen and, shoot, it all corrected it for me. But for folks who need that expansion piece, that abbreviation expansion, it does a really good job with that. BELVA SMITH: Josh, are there any new add-ins? JOSH ANDERSON: Not that I’ve used. I’ve used text expander, word expander. For being a free one, depending on how much you need, it’s pretty helpful. I use text expander on my Mac, which isn’t going to help someone on a PC. When I used to use a PC, I did use phrase expander and it was great, just because you could put those macros in. If I had to send an email, I’m sending the same one but all I could do is type “Dear” and the team member’s name, type in a date, fill in some boxes, and that all populates. So you’re not going back there and checking it out. You are also not sending the exact same email, so people know that your canned response to these. BELVA SMITH: Is that information then stored? So if you get a new computer, do you have to rebuild your library? BRIAN NORTON: You back it up to the cloud. I have it in my dropbox. What’s nice about that is now I can use that on my phone as well. I have text expander on my phone. It brings up a special keyboard on my phone, so if I want to use the expansion “respond to referral” on my phone, I can do it from there as well. BELVA SMITH: So that makes it way different than AutoCorrect because AutoCorrect is only working in Word. BRIAN NORTON: Exactly. The other thing I’ll mention just quickly is there is also keyboards that are designed for this. X-keys will be one. There are other macro keyboards where you are basically assigned to a particular key text, so it uses a software program that interfaces with the keyboard and allows you to put text on the screen. X-keys is one of them, it comes in a long stick version where you have 10 to 15 keys that are straight across, you can mounted to the top of your keyboard. Or you can get a number pad looking keyboard that’s from X-keys as well. Another option if they are able to press keys and use that, might be able to have a separate keyboard for those text responses or expansion things that you need. If you guys have any feedback on this particular question, we would love to hear from you. Maybe you guys use and expansion program yourself. We would love to hear from you. You can do that in a variety of ways. There is 317-721-7124 for our voicemail. Or you can send us an email at tech@eastersealscrossroads.org. We would love to hear from you. [57:02] Wildcard question: What do you use for personal reminder systems? BRIAN NORTON: So our wildcard question of the day is, I do a lot with reminders. I need reminders for just about everything. What I wanted to ask you guys is what type of reminder systems do you use, or have used? What has worked well? What works poorly? And anything that you are currently using now? Go. JOSH ANDERSON: I’m not a big help on this one. I don’t use any. BRIAN NORTON: You don’t need reminders? JOSH ANDERSON: I don’t use any anymore. I do look at my calendar. Everything goes on my calendar. Having reminders on actually cause more of a hindrance than a help, because a lot of my appointments are back to back. It would sit there and 50 minutes before when meeting is over, it would completely distract me, take me off course, and it would take me 15 more minutes almost to get back on course. The only things I use, I use the alarm clock in the morning, and I use three, because I figured out how to somehow in my sleep turn the first two off. But the one thing I do use on my calendars on my phone, I do check time to leave. Just because a lot of my appointments, I put the address in, and it will actually warn me about 15 minutes before I need to leave to go some certain place. That can be helpful, because sometimes I get caught on a phone call or something like that, or what was going to be an hour and have trip is now charging as an hour and 45 minutes or two hours due to traffic. I find that really helpful. The annoying thing is whenever you have GPS on and you are driving, every once in a while it will send a reminder that you need to go even though you are already in the way. Unfortunately it hasn’t quite figured out how to make that will work. BELVA SMITH: How do you do that? BELVA SMITH: So you have to include the address? JOSH ANDERSON: Yes. It has to have an address. Go to edit, go down to your alert, and you can do time to leave. BELVA SMITH: And this is on an iPhone? JOSH ANDERSON: It’s on iPhone just in the regular calendar app. But I find it really helpful. It’s not coming up all the time that I need to go down to Belva’s office or go to Brian’s office or something like that. But it is telling me that, hey, you need to be three hours away in 3 hours and 15 minutes. You might want to think about going downstairs and getting in your car. It can make it really helpful. BELVA SMITH: I think of reminders almost like a to do. I don’t like them. BRIAN NORTON: I knew it! BELVA SMITH: I do live by my calendar. Even though my calendar may not always make sense to anyone but me, I know where I’ve got to be and when I got to be there, just by looking at my calendar. With that being said, sometimes if I’m at home, I will say, A-lady, or Echo, remind me that Oliver’s graduation is Saturday, March 4. And then it will say, when should I remind you? I don’t know. Do I want to be reminded a week in advance or a day in advance? I don’t know. But as far as using any kind of a reminder app or minor on my phone, I just don’t do it. I get up and do an inventory every day. These are the things I need to accomplish today. And I guess that’s my way to do in my head. As far as something that’s upcoming, it just goes on my calendar. BRIAN NORTON: Right. I actually use my phone quite a bit. I use a Siri a lot, although it misspells just about everything I say. I do you Siri a lot. What happens is it’s just putting a reminder into the actual Apple reminders app. But I got If This Then That set up, and with the If This Then That, I use a program called ToDoist, and it will take anything that falls into my reminders app and put it into ToDoist for me. It’s available on all platforms because it’s basically it’s online. It actually allows me to keep track of my tasks, projects, people, those kinds of things. That’s how I do it. I also use the A-lady a lot for groceries or something really quick. And that shows up in my Alexa app. BELVA SMITH: Does not come to your phone? BRIAN NORTON: It does come into the Alexa app. I’m pretty sure, and I may look into it now that I’m thinking about it, but there is probably an If This Then That piece as well, so if it shows up on your Alexa app, it will shoot it over to ToDoist. I’m always interested in people’s workflows and trying to figure out how they manage everything, because it just seems harder in this day and age where we are more connected and we’ve got more to do that we set that expectation so high to be able to get so much done. Once you said that expectation, people expected of you all the time. JOSH ANDERSON: They sure do. BRIAN NORTON: Like I have high expectations for Belva and Josh. BELVA SMITH: But then you get like me, a little bit older, and you’re like, my to do list is going to go from this to this. JOSH ANDERSON: This isn’t quite the reminders one, but I’ve tried to use Omnifocus and some of those big programs. I realized I was getting behind on other things trying to keep it up-to-date. I used one note for a while trying to keep things. Now I use essentially the note app, calendar, email, the three places I hide most stuff and I can get back and find it. I can use Siri to put a note in the note app. I think you can set reminders straight from there if you want to. The phone goes off so much between text messages, email, and phone calls, that one or two more vibrations a day and I don’t know if I could take it. BRIAN NORTON: Starting to twitch. BELVA SMITH: Especially in the evening, when you get home and you don’t have your phone glued to you but you have it laying across the room. JOSH ANDERSON: You pick it up and there are 25 things. BELVA SMITH: Do I need to go look and see what that is or not? JOSH ANDERSON: Is that my mom? Someone I want to talk to and catch up with? Or is it I’ve got a meeting in two weeks. BRIAN NORTON: It is amazing how expectations have changed because of how connected we are. It’s the nature of society these days. We would love to hear from you. Tell us what kind of productivity tools you use, what kind of to do list, workflows you guys use. We would love to hear from you. You can give us a call on our listener line at 317-721-7124. You can also send us an email at tech@eastersealscrossroads.org. Or send us a tweet with the hashtag ATFAQ. I want to thank you guys for taking time with us today to listen to our show. I want to say thank you to Josh and Belva for being a part of it. Belva? BELVA SMITH: See you guys in two weeks. JOSH ANDERSON: I guess I’ll see you in two weeks too. BELVA SMITH: It’ll be tax day. BELVA SMITH: That will be the day we record. That won’t be the day you hear it. BRIAN NORTON: Thank you guys again for listening. Without your questions, we certainly don’t have a show. Be a part of it. We would love to hear from you. Take care and have a great one.